CLEAN. RENEWABLE. BASE LOAD. RELIABLE. JOB INTENSIVE. 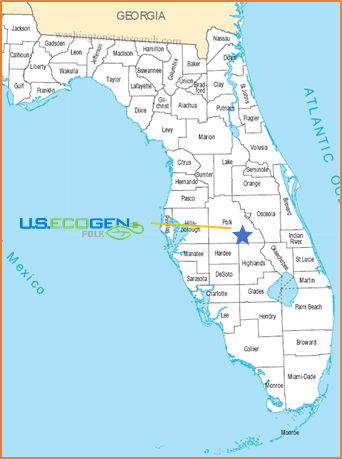 US EcoGen Polk is the first in a series of US EcoGen biomass generating facilities. Located in Fort Meade, Polk County, Florida, US EcoGen Polk is a 66 MW (Net Capacity) biomass bottom-cycle electrical facility that will be fueled primarily with urban wood waste. 100% of its output will be sold under a 29.5-year PPA that was approved by the Florida Public Services Utility Commission in October of 2011. On July 2012 the Florida Department of Environmental Protection issued a final air permit authorizing construction and operation. All other required construction and operating permits have been received to allow full construction to proceed. In December 2016, construction of the 2.5-mile Fuel Delivery Roadway began, that will be vital to delivering fuel to the plant. In April 2017, Duke Energy Florida began construction of the Large-scale Generator interconnection to the Fort Meade sub-station adjacent to the plant site. Gemma Power Systems is constructing the power plant under a turnkey Engineering, Procurement and Construction agreement.